The Indians of the Hualapai Nation will welcome you to their homeland! 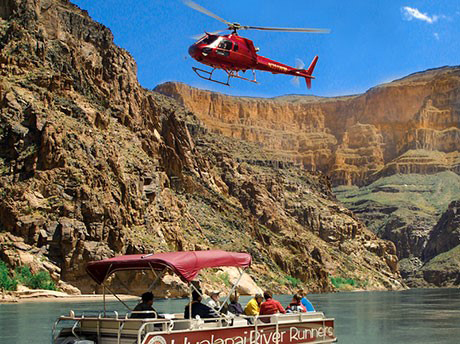 This is the Grand Canyon West Rim Bus Tour PLUS an exciting helicopter flight and boat ride. Your drive to Grand Canyon West Rim will take you over the Mike O'Callaghan–Pat Tillman Memorial Hoover Dam Bypass Bridge. Travel the remote area known as Black Canyon, which has played a significant role in the development of the American Southwest, from the ancient Anasazi Indians and the steamboat landings to its present day use as part of the Lake Mead National Recreation Area. Pass through the Mojave Desert and the 900-year-old Joshua Tree Forest, one of the largest of its kind. Arriving at Grand Canyon West, you will be greeted by the Indians of the Hualapai Nation, who will welcome you to their homeland. Eagle Point contains the most notable attraction, the Grand Canyon Skywalk, a glass bridge that suspends 4,000 feet above the Grand Canyon floor. There is a walking tour through authentic Native American dwellings, an amphitheater with live Native American performances at 1:00 and 5:00 p.m. from multiple, and handmade Native American jewelry and crafts. 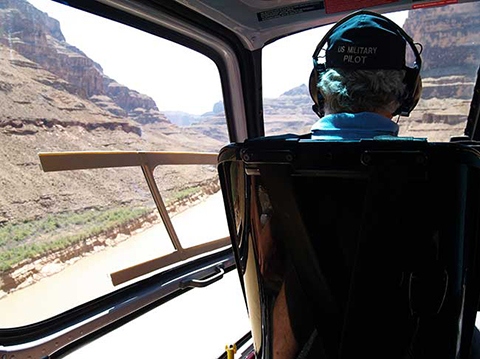 Your tour includes the West Rim Bus Tour plus a thrilling Helicopter Flight. Soar like a golden eagle over the Grand Canyon past Guano Point. 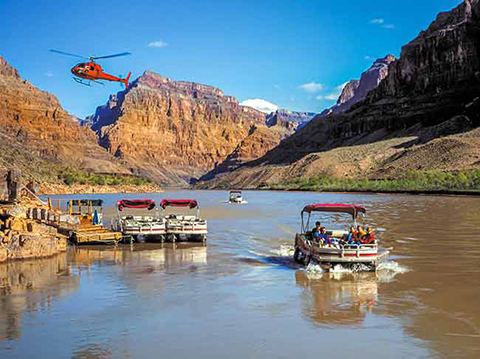 This 15 to 20 minute flight provides sights and views of rock formations and the Colorado River only available with this exclusive tour. Flights are narrated and are flown in the most advanced state-of-the-art helicopters built today. Only the Eco-Star and A-Star helicopters are used, ensuring a smooth, stable flight with all forward-facing seats. This is a great option on its own for those who want a little more of the helicopter experience. 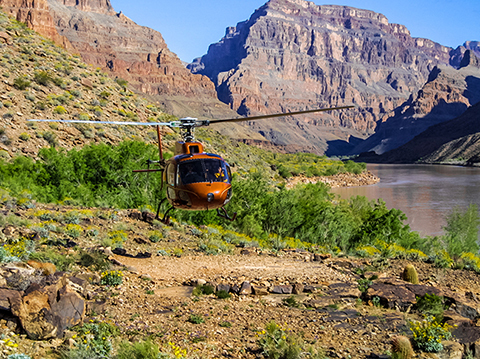 Our tour allows 4 hours to explore the Grand Canyon West Rim while other tour companies offer only 3 hours. This tour is closed for the season. You may book this tour if your travel date on or after March 1, 2019. A full 4 hours to enjoy this unique destination. See all they have to offer—Eagle Point, the Skywalk, Guano Point, Indian Village, Hualapai Ranch, Cowboy Town and more. You choose how to spend your time. The West Rim is the rustic side of the Grand Canyon and home to the Skywalk.